JTJB Managing Partner Murali Pany was a panelist in the Leaders’ Forum held at Marina Bay Sands on 14th March during Asia Pacific Maritime 2018. The Leaders’ Forum moderated by Chief Investment Officer of Prudent Shipping Investments, Divay Goel, also comprised Vijay Kamath, Cleaves Asia Pte Limited, Peter Sand, BIMCO, Mathias Steck, Digital Consulting and Smart Cities, Asia at DNV GL. The panel shared their expert insights on the key issues that were being tackled by maritime stakeholders and the forecast for the maritime industry in 2018. 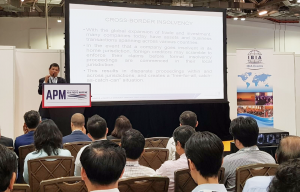 JTJB Senior Partner Danny Chua presented a paper at the IBIA Asia Symposium held at Marina Bay Sands on the 15th March during Asia Pacific Maritime 2018. Dany Chua spoke about cross bord er insolvency and the effect of the Hanjin Shipping case in particular in terms of judicial recognition and payment of claims. The presentation was well received and transited into a post-symposium interview where Danny Chua commented on an expected decline in bunker supply disputes in view of the introduction of the mass flow meter. He also shared his insights on the ineffectiveness of retention of title clauses in bunker supply contracts. Click on the links below for more information. JTJB Managing Partner, Murali Pany was asked for his insights along with other leading maritime industry players during The Business Times Roundtable Discussion. Views on the opportunities and challenges that lie ahead for ship owners and the global maritime industry were discussed. Click on the link below for more information. JTJB Consultant, Dato’ Jude Benny has been recognised by the 10th Edition of The Best Lawyers in Singapore under Maritime Law. Recognition in Best Lawyers is widely regarded by both clients and legal professionals as a significant honor, conferred on a lawyer by his or her peers. For more than three decades, Best Lawyers publications have earned the respect of the profession, as the most reliable and unbiased source of legal referrals. 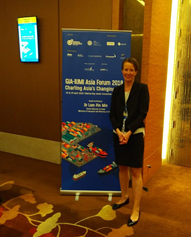 Eva Braje from JTJB’s Hamburg Network Office, attended the International Union of Marine Insurer’s first Asia Forum in Singapore. The forum was graced by Mr. Lam Pin Min, Senior Minister of State, Ministry of Transport & Ministry of Health. Several subject matter experts and policymakers were invited to share their expert insights and analysis on current issues in the marine insurance and maritime industry. We hold boutique events to enable our clients to network and make new contacts in an enjoyable environment. The dates of events stated above are to be confirmed and subject to change.